After a surprise detour suggested by Boise's mayor to look at an alternative site, the focus for a Boise stadium proposal funded in part by taxpayers has refocused on a spot at Americana Blvd. and Shoreline Drive. The other group working to get citizens to show up is Concerned Boise Taxpayers - a coalition of business interests and citizens who say they are worried about the public money and tax implications of the project. Some members also own homes near the proposed site. The Vanishing Boise group also shared the CBT invite and prompted its followers: " Let’s find out why - if this is such a great commercial venture - that a subsidy of our hard-earned tax dollars is necessary?? " The City of Boise is working to tweak a number of its rules around development - mostly in neighborhoods. The proposals have some people fired up, and attracted disapproving letters from the North End Neighborhood Association, among others. The City made a number of adjustments to the proposal and provided additional information to allay some of NENA’s concerns. City leaders say the changes are small, and designed to tighten some requirements and ease others. Cody Riddle, Current Planning Manager with te City of Boise says this change gives them the ability to put more scrutiny on these applications. Another change would impact who gets notified when a homeowner wants to make a so-called administrative change to their home. Currently, every neighbor within 300 foot must be notified and a neighborhood meeting must be held - even for changes like the addition of a kitchen or room add-on. The new proposal would rework the process. Instead of a neighborhood meeting, residents would be required to get written consent from every landowner who has property that touches theirs - as well as notify the neighborhood association for their part of town. “99% of the time it’s just the adjacent landowners that care or get involved anyway,” he said. If a landowner can’t get written consent from every neighbor, they must still hold a neighborhood meeting for every landowner within 300 feet. Planners have also proposed to adjust the rules around second homes - or “accessory dwelling units.” Current City code limits these types of buildings to 600 square feet and a single bedroom - or ten percent of the land area of a parcel. The proposal would increase the size limit of an ADU to 700 square feet (but still limited to one bedroom). You can read the full rationale for the changes here. None of the proposed changes affect zoning code or rezoning. 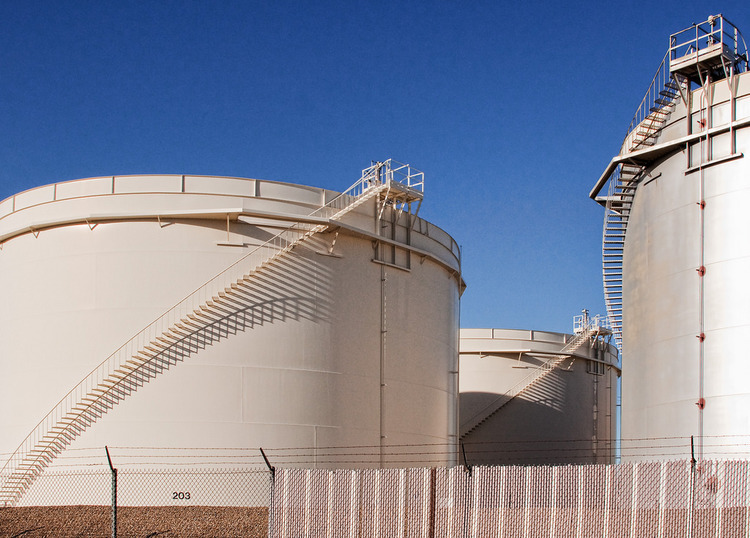 They also don’t impact most commercial projects or conditional use permits. 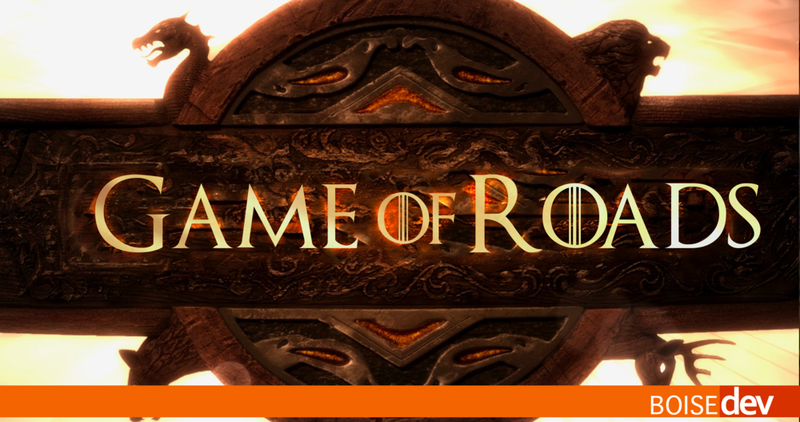 The fictional world of Game of Thrones is filled with intrigue, fantastical characters, and fire-breathing dragons. It's unlikely any of those things will show up in Kuna - but a new subdivision will carry a bit of the GoT mythology. The future Silver Trail subdivision in the area of Ten Mile Rd. and Columbia Rd. is planned to have a pair of streets that pay homage to the popular HBO show. Residents will soon have the option of purchasing a home on Baratheon Ave. or Rickon St.
Baratheon is the family name of the first king depicted in the series, Robert - and his family lineage (or assumed family lineage at least) is littered with folks who meet with ill fates. Rickon refers to the son of protagonist Eddard Stark on the show and the book series it is based on, A Song of Fire and Ice by George RR Martin. The street names were the idea of Jennell Hall of B&A Engineers, Inc.
"On that subdivision my supervisor just let me go wild, so I did," she said. "He now usually gives me a theme to follow... but I'll still sneak in a geeky one here or there." 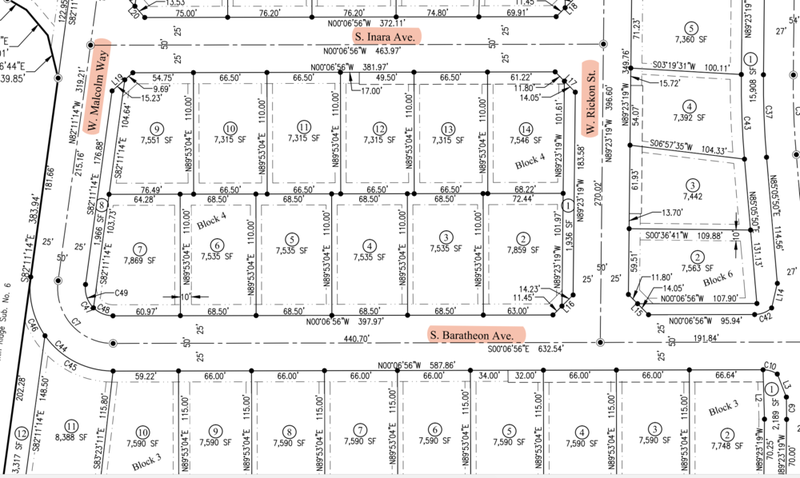 Other streets in the subdivision are slated to sneak in references to the 2000s show Firefly - and more GoT-themed streets could be in the future as the subdivision is plotted out. Silver Trail will feature homes constructed by CBH Homes. The GoT-themed roads got their names after the Ada County Street Names Committee rejected earlier ideas, This Ave. and That St. (Abbott & Costello would have been proud). The full plat plan for the subdivision shows names like Sansa, Arya, Greyjoy and Tyrion in future phases. Streets with names Stark, Tarth and Samwell were all denied for various reasons (mostly due to rhyming with other names in the county - Stark and Clark for instance). If you happen to see any wild hogs in the area, you might want to steer clear. Or guys named Ramsay. The Capital City Development Corporation's annual report shows the projects it has wrapped up or is working on. 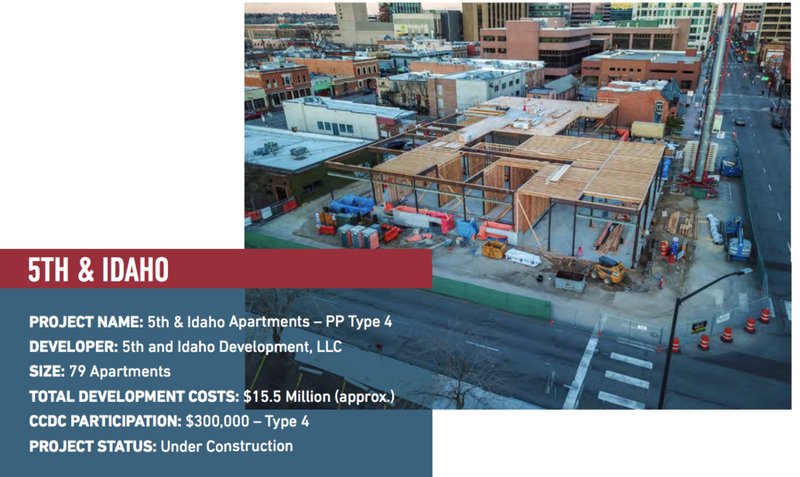 The report gives a snapshot of all the projects underway throughout Downtown Boise - and how the agency's property tax dollars collected via tax increment financing are being used. The report breaks the projects down into economic development, infrastructure, parking/mobility and placemaking. Nearly every project has been covered on BoiseDev (the handy search function helps find anything! 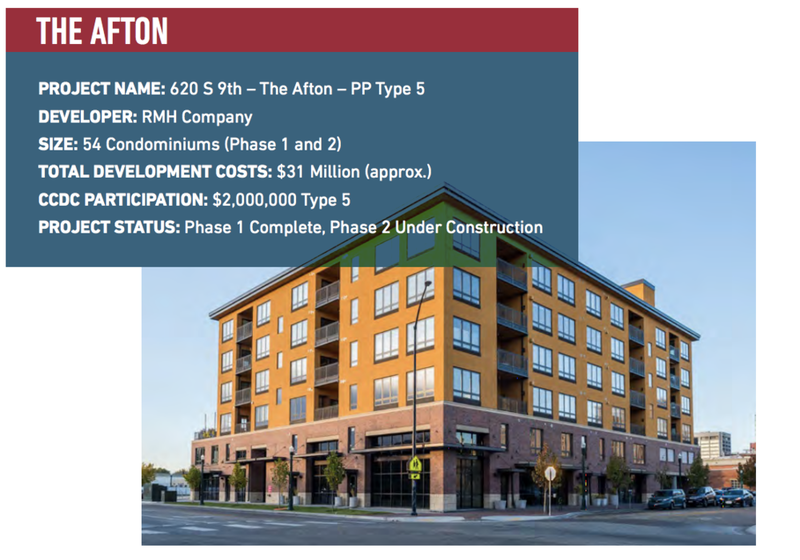 ), but here's how the projects are touted in CCDC's report. "Cultivate commerce and grow resilient, diversified and prosperous local economies." "Improve public infrastructure to attract new investment and encourage best use of property"
"Expanding mobility choices, improving infrastructure and encouraging innovation are imperative actions to making Boise competitive and equitable." "Communicating with our stakeholders for guidance and buy-in helps build trust and a stronger community"
The Capital City Development Corporation created its Central District in 1986. The tax increment financing district was the first of its kind in Boise, and funneled any increase in property tax collections from schools, police and the like over the the CCDC for improvements and other projects to help increase those property values. Now, the 30ish-year time horizon for the central district is about to terminate - or 'sunset' as CCDC is calling it. Before sun goes over the horizon, the agency is working to close out projects and spend the final tax dollars. Says CCDC: "After extensive research and design regarding options for urban flower planters in downtown Boise, flower planters are the appropriate choice instead of hanging planters." 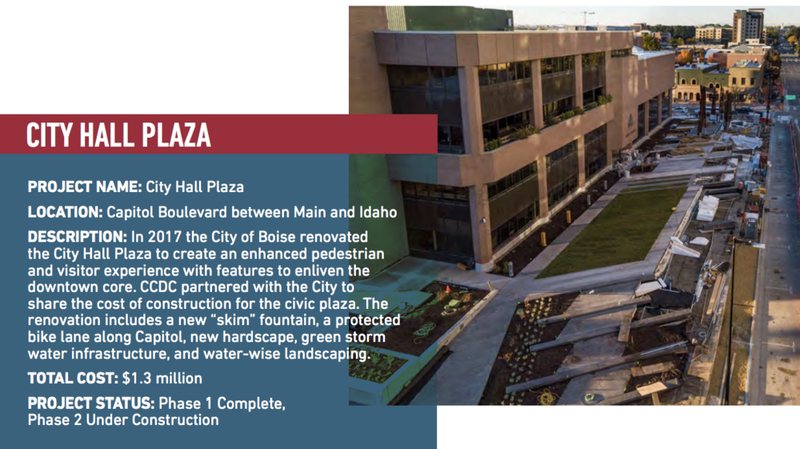 CCDC is working with a bunch of partners like the City of Boise, Downtown Boise Association and others. 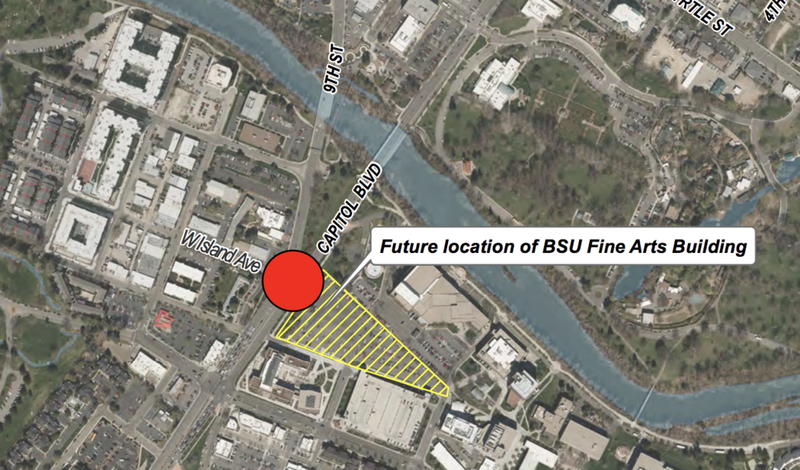 The urban renewal agency will turn over 8th St. to the City of Boise later this year. The Capitol City Development Commission has closed down the two blocks of 8th Street it owns between Main and Bannock Streets. The popular “restaurant row” area is being used for staging crews and materials for a sewer line upgrade downtown. 8th Street is being used to limit impacts to traffic on 9th Street and Capitol Blvd. Cyclists, pedestrians and delivery trucks can still use 8th - but regular traffic is off-limits. Work is expected to wrap up on February 13th. Separately, large white “X” markings have been spray painted on some trees along 8th. These trees have been determined to have reached the “end of their life” and will soon be removed. CCDC is planning a number of changes and improvements to 8th Street and connecting alleys on the Idaho to Bannock block as the upcoming termination of the original urban renewal district approaches. This story came from a tip on the BoiseDev Facebook group. Join the community! Heap of history. Courtesy Jonah Shue. Ada County Highway District crews are doing some roadwork in the area of 16th and State St. in the North End - and unearthed a giant pile of metal beams. Turns out, according to ACHD spokesperson Nicole Du Bois, the metal is from old trolley tracks that once ran along State Street. The tracks are likely more than 100 years old - part of a trolley system that rolled through downtown Boise in the decades surrounding the turn of the 20th century. May 17, 1928 marked the official end of the trolley era. At 6:00pm the trolleys were taken to the storage barn, the few remaining patrons were given bus schedules, as they had now replaced the trolley line. Sadly, little sorrow from the public accompanied the close of the trolleys. People had long been complaining about poor service, bumpy rides, and unsightly cracked pavement around the tracks. 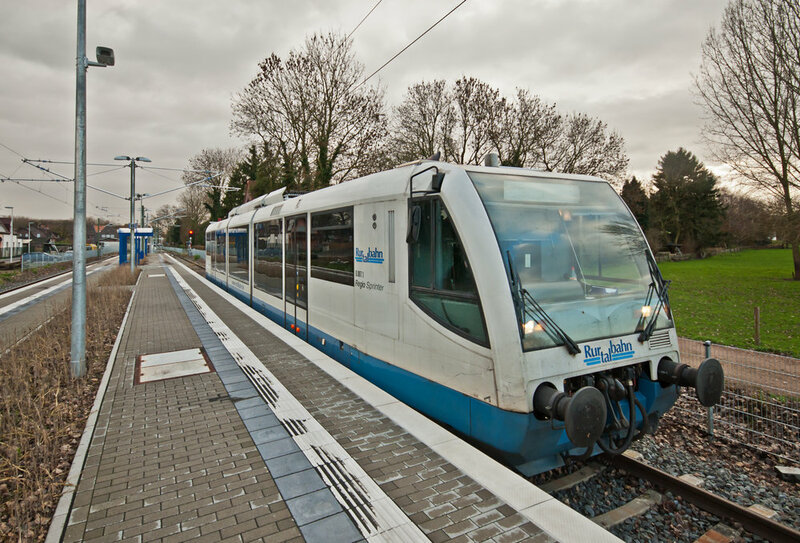 However, for the few that faithfully rode the trolleys, the engineers and conductors who maintained and ran them, it was the end of an era. The City of Boise hopes to startup its own $100-million trolley system in coming years that would again ride the streets of Downtown Boise. The project is technically approved by Boise City Council, but a funding source has not yet been identified. The city has identified $3.5 million in tax dollars to start work on the project. ACHD is replacing a bridge over a culvert in the area, and will wrap up work in mid-February. Front Street & Myrtle Street run through the heart of Boise - part of a highway and freeway system that move cars into, out of and through Downtown. But the roads present a literal barrier to those on foot - serving as a major dividing line in the Capitol City's heart. Changes could be coming to those streets, but a consultant's ideas may be a tough sell. 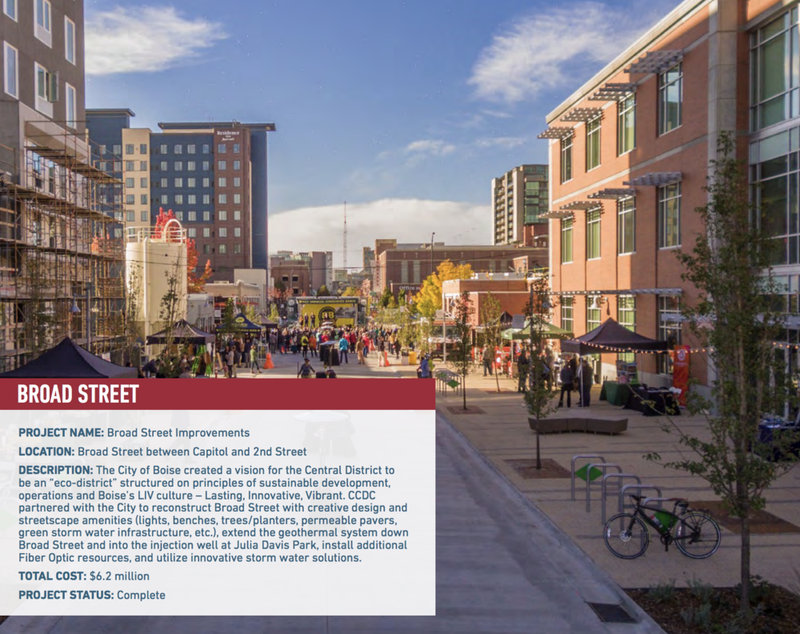 BoiseDev was the first to report on the project to develop a set of plans to make Front St. and Myrtle St. as they run through Downtown more than just freeway offshoots. Now, for the first time, the plan is revealed here to the public. 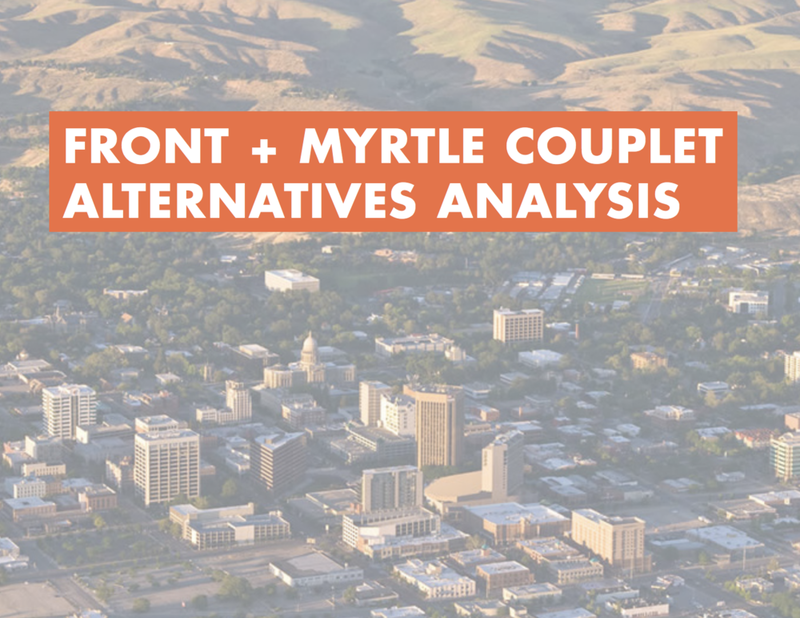 Sam Schwartz Consulting has turned in its Front and Myrtle Alternatives Analysis - which lays out the current situation and potential future of the two roads. Front and Myrtle form a couplet - flowing off the Interstate-184 freeway and ending at Broadway Avenue. The streets were a vital part of the early-90s era Broadway-Chinden Connector which remade east-west transit through the city core. That project put a "freeway to freeway" connection right through Downtown Boise. 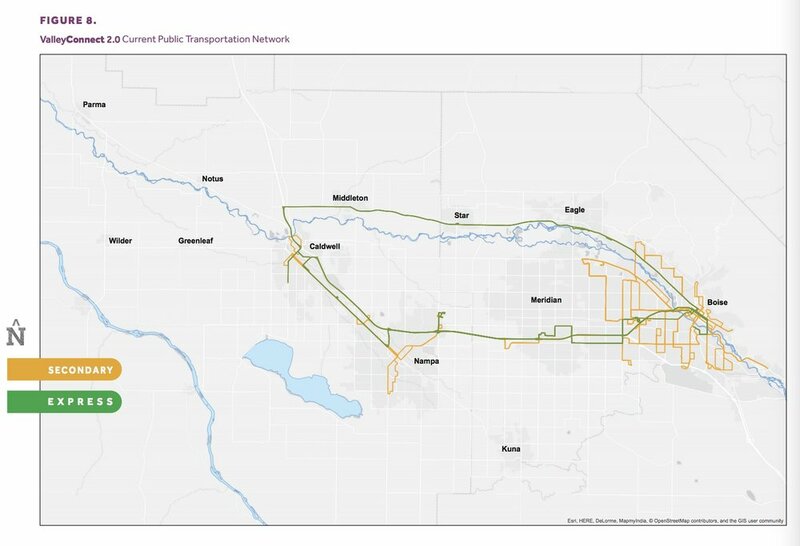 Each of the streets is controlled by the Idaho Transportation Department as state highways, and as such are not under the purview of the Capital City Development Corporation or City of Boise, or even the county-wide Ada County Highway District. As we reported last year, the CCDC/City of Boise group went back and forth extensively with ITD over how the Alternatives Analysis, with the City and CCDC wanting an emphasis on “shift(ing) in focus away from moving cars with minimal delay,” while ITD lobbied for language that didn’t inconvenience auto drivers. Cars are currently allowed to go 35 MPH along the streets - typical for many surface roads, but outside the norm for the rest of the downtown street grid which features a 25 MPH limit. Each road has five lanes - which when combined with high speeds can mean crossing north-to-south while on foot can mean long frustrating waits. The Alternatives Analysis found that the roads actually have a surplus of capacity for cars - and suggests that it could be put to use to make the roads more friendly for those using bikes and their feet without causing major harm to drivers. “(The) preferred alternative generally prioritizes strategies that reduce excess roadway capacity and vehicle speeds, aims to improve safety for all street users, and reduces north-south crossing distances,” the report notes. The consulting team suggested cutting the roads from five lanes to three in spots - but mixing in segments that are four and five lanes as well - depending on the needs for each block. Front St. would be cut from five lanes to four between Broadway & Capitol Blvd. It would jump back up to the current five lanes in the heart of downtown from Capitol to 9th St., then go back to four lanes from 9th until the mouth of the Connector at 13th St.
On Myrtle, five lanes would stay in place from the end of the Connector and 11th St. Then it would drop to four lanes until Capitol. Then, the current five-lane road would three lanes all the way to Broadway - though some turn lanes would be mixed in on this stretch. Vince Trimboli, Idaho Transportation Department Public Affairs Manager said that concept will be a difficult one. By cutting down to three lanes in even a portion of the road - it could cause problems. “If you… squeeze your traffic down to one lane essentially, you could potentially create safety and mobility concerns by just backing traffic up,” Trimboli said. 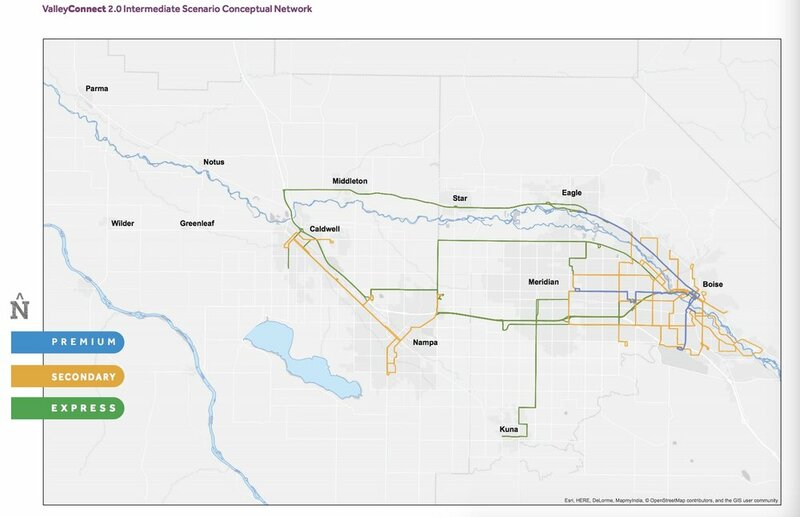 While the Alternatives Analysis primarily focused on the roads as they exist as part of Downtown Boise, Trimboli said many users have to be considered for a portion of the state highway network. The City of Boise did not respond to requests for comment. Appreciate this type of independent, in-depth reporting? Consider making a contribution to help BoiseDev sustain and grow. Bike lanes? No. Parking? Yes. Taking out lanes would free up room for other uses - but in what will come as a surprise to some, one of those suggestions isn’t new or expanded bike lanes. “Bicycle facilities were generally not favored by the project team, as parallel facilities along Main and Idaho are currently under consideration,” the report said. Bike lanes on Main and Idaho have been hotly contested and were even briefly installed - but for now, remain absent on these adjacent streets. Instead, extra wide sidewalks and car parking would be slotted in along the the two highway roads. For instance, at Capitol and Myrtle, the Alternatives Analysis suggests removing the existing shoulders (which are used by some as bike lanes) and extending the sidewalks. Near Trader Joe’s, where a lane is suggested to be removed, the sidewalk would be vastly expanded at the corner with a place for bike parking - and a row of new on-street parking for cars. On the three-lane stretch of Myrtle St. that runs near Julia Davis Park, two lanes could be removed, and replaced with tree-lined sidewalks as well as parking for both cars and bikes. Four new stoplights and three additional crosswalk legs could be added on the couplet if the suggested plan were to be fully adopted. On Myrtle Street, stoplights and pedestrian crossings are suggested at both 5th Street and Avenue A. In the case of Avenue A, adding crosswalks here would cut down the nearly half-a-mile stretch between 3rd Street and Broadway that provides no way for bikes or those on foot to cross Myrtle. A new light at 5th Street would help connect downtown to a new pedestrian path that links to Julia Davis Park. For Front St., new stoplights could be added at 10th Street and 12th Street. The 10th Street light would give pedestrians easier access to JUMP and the Simplot headquarters. New west side crosswalk “legs” could be added to existing crossings at Ave. A, 2nd Street and Capitol Blvd. Right now those intersections only have crosswalks on the east side due to turning traffic and potential conflicts. The report didn’t specifically make a recommendation about what to do about the 35 MPH speed limit. It did include a page about “Other ITD facilities” and noted that both Highway 26 in Downtown Idaho Falls and The I-84 business loop in Caldwell have speed limits of 25 MPH in urban environments. “Neither of these examples are analogous to Front and Myrtle, but are instead offered to provide context for the potential for lower speeds,” report writers noted. A CCDC official told me last year that reducing the speed from its current 35 MPH posting would have several impacts the agency viewed as positive - including reducing the amount of time it takes cars to speed up and slow down, and making the streets quieter and calmer in general. ITD has held to the 35 MPH limit. The conflict is noted in the report’s opening pages. Trimboli says comparing Front & Myrtle to the roads in other roads isn't a complete comparison. "It’s an apples to oranges comparison because it’s a freeway-freeway connection. I-84 back to I-84 via Broadway," he said. Schwartz suggests looking at signal timing along Front Street during peak rush hour. Right now, vehicles are given 140 seconds for each green cycle in rush hour periods - which means people on foot, bike or car who want to get across Front wait nearly two minutes. The reports says cutting the cycle length time to 90 or 100 seconds could have small impacts to traffic on Front - but concedes that signal timing on Front and Myrtle are all tied into the wider timing of streets across downtown, which the report writers acknowledge is beyond the scope of their report. A pedestrian walkway like the one soon to be constructed over Ave. B by St. Luke's Health System isn't suggest for Front or Myrtle. Last fall when BoiseDev first broke word of this process, the headline included the phrase “visions of tunnels & skybridges” - based upon reporting from stakeholders who wanted to see “big picture” ideas for Front and Myrtle in the future. But the report bats down these ideas. In essence, Schwartz's team argues that putting the road in a tunnel or building a skybridge over the top causes many problems. Even thought a skybridge gets people on foot and bike up and over the cars, they make “inconvenient diversions.” To access a skybridge, you often have to take a ramp, elevator or stairs - instead of just crossing the street a normal crosswalk. For tunnels, they can be “potentially unpleasant.” If you’ve ever been in a car tunnel, they aren’t exactly a place you want to spend much time. And lastly - either option is expensive. “Bridges and tunnels would also be significantly more expensive than street design and traffic signal changes,” the Schwartz report said. While City of Boise spokesperson Mike Journee did not respond to a request for comment, the Capital City Development Corporation and Idaho Transportation both emphasized it's not a final solution. CCDC and ITD have worked together to implement several portions of the plan - including an extensive project to expand the Pioneer Pathway connection at 11th and Myrtle. “Other near-term improvements include expanding corners and shortening pedestrian crossing distances at 20 locations along Front and Myrtle, set to occur with the resurfacing of those streets next spring,” CCDC Project Manager Matt Edmond said. Trimboli said the plan is one idea for the future - but more negotiation needs to happen. Trimboli said his agency and the City worked together on the Broadway Ave. bridge completed last fall and hopes something similar can happen with this project. Edmond echoed the need for more collaborative work to come. Schwartz’s firm and two partner companies collected about $200,000 for the review project. The Capital City Development Corporation staff have instituted a program to put "boots on the ground" throughout its four tax increment financing-backed urban renewal districts. "The goal is for every employee to walk every blockface of every CCDC district," CCDC executive director John Brunelle wrote in his monthly board note. The idea is for each of the agency's employee to walk each block face of every CCDC district. "So far we have completed the Central and Westside districts and a portion of the 540 acre River-Myrtle/Old Boise district," Brunelle noted. Each employee looks for "problems and opportunities," including streetscape issues and any pedestrian or bicycle challenges. Employees take photos and report back on what they see. "As the days grow shorter we plan to stay close to our actual work, walk faster, see more, and keep moving ahead with boots on the ground.," Brunelle wrote. A group of connected Boiseans hopes to stop a downtown baseball and soccer stadium in its tracks, and is willing to press their case with the county prosecutor to do it. A complaint filed late last month with the Ada County Prosecutor alleges the Greater Boise Auditorium District worked to circumvent Idaho's open meetings law in order to conceal dealings with the developer of a proposed downtown Boise stadium. The five-page complaint includes a string of email messages involving GBAD executive director Pat Rice and Greenstone Properties principal Chris Schoen. Greenstone is hoping to build a stadium on land currently owned by St. Luke's Health System near the Boise River in a complex deal that would include tax dollars, public bonds and private funding. The Concerned Boise Taxpayers group led by former Albersons CEO Gary Michael and former Idaho Stampede lead investor Bill Ilett sent the letter to the Ada County Prosecutor on October 24th. BoiseDev was provided a copy of the letter and supporting documents from CBT. "Since I have 5 board members and a quorum requires a public meeting, I’d recommend an hour each in groups of 2+1," Rice wrote to Schoen in September of 2014. That e-mail, with carbon copies to John Brunelle with the Capital City Development Corporation and Jade Riley in Mayor Dave Bieter's office among others, is the central piece of evidence in the CBT complaint. In a follow up message to LeAnn Hume of Cushman & Wakefield Alliance, Rice again reiterated the importance of keeping his board in small group meetings. "2 board members can meet. Then if we can tentatively plan for another meeting at 5 for 2 more board members that could work. As I mentioned previously, I can’t have more than two at a time otherwise it is a quorum." 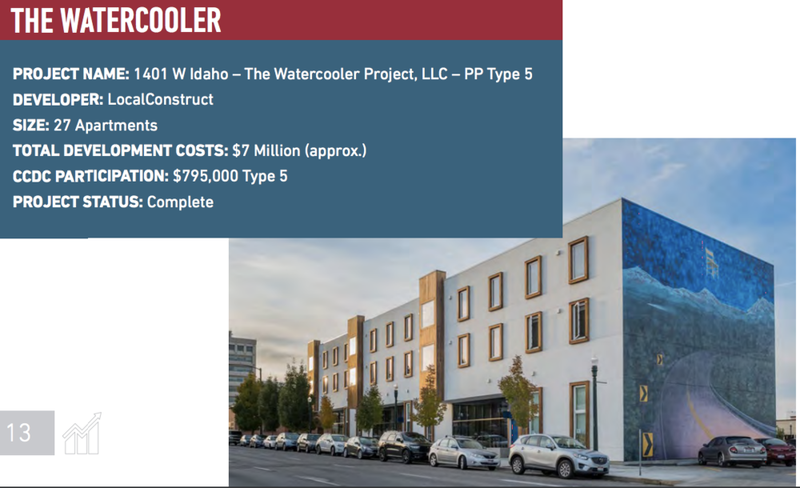 The Michael & Ilett group requested thousands of documents from the City of Boise, CCDC and GBAD via public records requests, and provided many of those documents to media outlets including BoiseDev. "As we searched through the documents provided in response to our public records requests, it was clear to us that the Idaho Open Meeting law was ignored," Michael said. "We want it investigated and, if the law was violated, we want it brought to light." When contacted, the Ada County Prosecutor would not comment on the existence of the letter. “Disclosure of such records would compromise any ongoing investigation that might be taking place by disclosing complaining witnesses and the details of any statutory default that might have taken place," Ada County Prosecutor Jan M. Bennetts wrote. 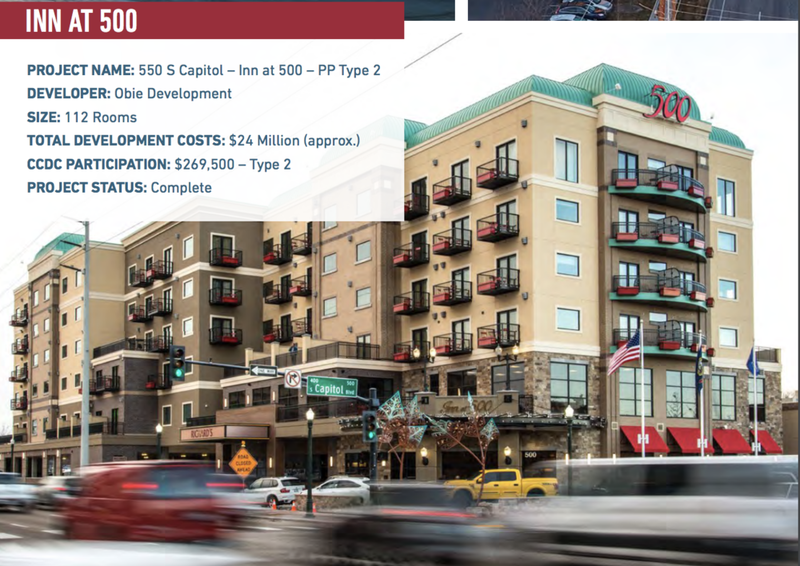 Rice had not seen the complaint when contacted last week by BoiseDev. After review, he was unable to comment fully on the record. "This is a complaint in progress," Rice said. "If the county prosecutor contacts us, we are going to cooperate fully. " He emphasized that though the City of Boise is working to move the project forward, his agency has had no formal involvement to this point. "We are not committed to the project at this stage and the board has not seen any type of formal proposal." After reviewing the complaint, Idaho Press Club president Betsy Russell expressed concern over the meetings as outlined. "It's clearly a violation of the Idaho Open Meeting Law," she said. "The point of the law is to ensure that the public's business is done openly and that the public can observe it." Russell also serves with Idahoans for Openness in Government and says that group holds seminars on this very topic. "It appears to me to be a classic case of what we call a 'serial meeting'," she said. "Elaborate subterfuges designed to avoid a quorum and allow a series of smaller meetings to substitute for an open public one as a public agency deliberates on a topic not only would defeat the whole purpose of the open meeting law - they also clearly violate it." Ilett says that's the central argument behind their complaint. "The documents show that City Hall and GBAD have been very devious in the way they have pushed the project forward, working with the out-of-town developer for the past two-plus years without public disclosure," he said. Michael said this tactic is about one thing: stopping public dollars for a stadium. "Our overall goal is simple. We do not want the baseball stadium built with public funds. It is the wrong project in the wrong place. " The Capital City Development Corporation has been leading an effort to add so-called "wayfinding" signs to Downtown Boise for more than five years. The Boise Weekly first wrote about the effort in 2013 - but progress was anything but quick. After a multitude of delays - the project is finally starting to inch forward. The agency is set to put up a set of signs all across the downtown core and beyond to help make it easier to find top attractions in the City of Trees. The signs will actually look somewhat like trees - with metalwork designed to look like branches. 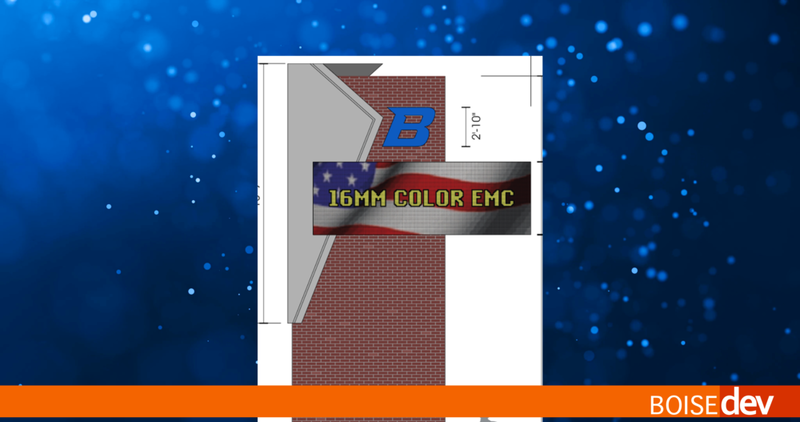 They will feature an olive color, with accents of purple, orange and other colors (typical Boise colors like blue and green are harder to use due to federal highway sign standards). CCDC, the Ada County Highway District and the City of Boise have approved the sign program - and will start with a test sign in front of Julia Davis Park this fall. The original Boise Weekly story noted that Missoula spent $100,000 on its sign project. 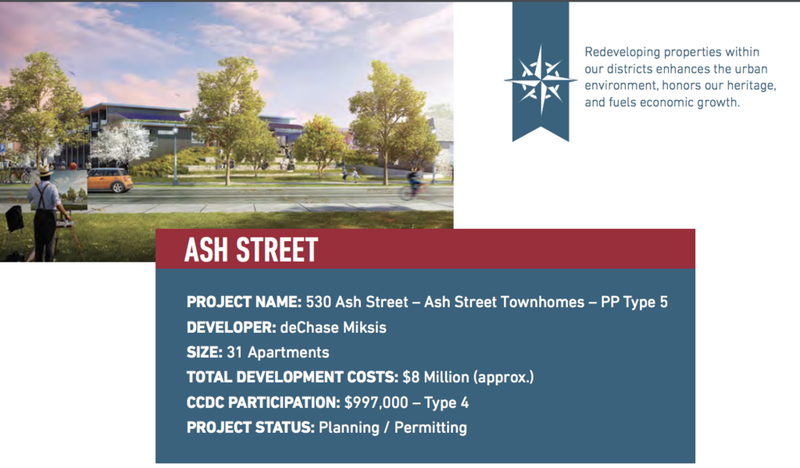 The Boise project will cost taxpayers quite a bit more - $1.465 million according to CCDC estimates. These large signs would be more than twelve feet tall and would be located at the major entrances to the downtown core. They would extend the tree theme on to the sign face and would feature large "Welcome to Boise" messaging. Downtown would be split into five "zones," which each would be color-coded. The area south of the Boise River, which includes Boise State and several major parks would be themed in blue. Signs to help bicyclists would be added throughout, giving approximate bike-riding distances to major attractions. These signs would carry the themed district colors. A number of map kiosks are planned, with local areas as well as a downtown-wide map. The samples included in public documents say "City Wide," but only depict downtown. To help drivers find a place to stow their cars, blue parking signs are in the plan. Smaller pedestrian versions would help folks on foot get back to their cars. A new public art installation is planned for Downtown Boise -- on the ground. The intersection of 8th and Fulton - near the Foothills Learning Center - is set to see a printed mural project from local artist Jason Keeble. The project is set to be installed this spring, and will feature a multi-color zig-zag pattern in the area between the crosswalks. "This area is in great need of a color splash," Keeble wrote in a design presentation. "This design offers a chance to brighten up the area in a fun and engaging pattern." Keeble notes that the installation will look different depending your viewpoint. The Boise Department of Arts & History is behind the project - with funding from Capital City Development Corporation. It is one of a number of projects along the 8th Street corridor in various stages of execution. The art installation is a pilot test to see if it would be viable in other areas, in partnership with the Ada County Highway District. The mural is set to remain in place for one year. An updated design with more green and less orange and red has been provided by the Arts & History team. The Capital City Development Corporation, citing an increase in demand, plans to hold a public hearing to raise parking rates in its downtown Boise garage. Every type of parker would be affect by the increases - including hourly, monthly and hotel guests. 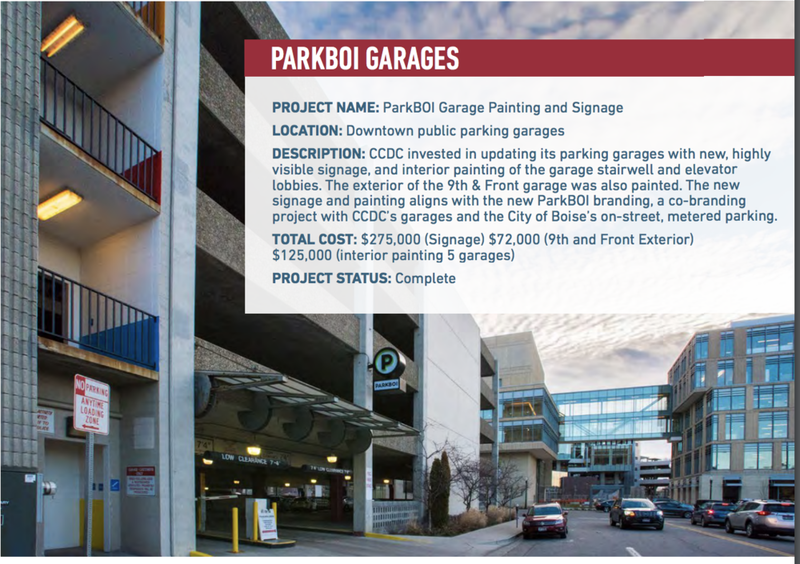 The Capital City Development Corporation, which administers the public parking garage in the Downtown Boise core knows it has a problem -- one it anticipated. CCDC chair John Hale said during a public meeting earlier this month that the tight parking situation is a "good problem to have." "This continues to be a problem that is growing, it is not leveling off," Hale said. "We as a board are going to have to make some tough decisions in the next 90 days." Those problems include a fully sold-out allotment of monthly parking spaces in the publicly-owned garage system. A growing number of workers are turning to paying the daily rate to stow their cars in the public garages, which is causing garages to fill up and divert folks who may be coming to downtown for just a few hours to a less-ideal parking spot. CCDC has seen an 81% increase in so-called all-day parkers - and the number has spiked in recent cold-weather months. “We have attempted to accommodate everybody," CCDC parking & facilities director Max Clark said. "Historically we’ve been able to do that because it’s (been) a sleepy downtown." The agency last raised rates in early 2016 - which caused about ten people to cancel their parking passes, according to Clark. For those who park their cars in any one of the agency's six public garages, the hourly rate would increase by about 17% - from $2.50 per hour to $3 per hour. The popular "first hour free" program would be retained for those who are able to get in and out quickly. The maximum daily rate would also rise - up 20% from $12 to $15. Currently, the monthly rate at each garage is different - but under the plan, rates at all garages would increase significantly. 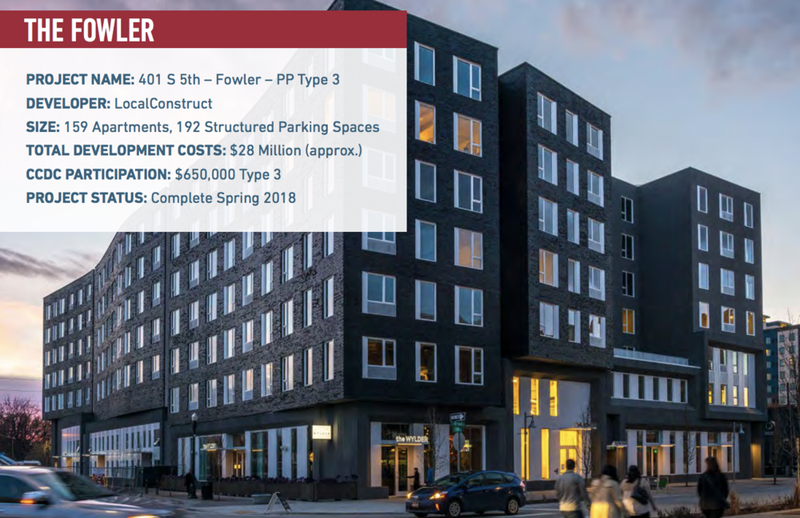 Two new garages are set to come online soon - the 5th & Broad St. garage - which would set monthly parking at $175, and the 11th & Front garage that's part of Parcel B - which would offer a deal at just $100 per month. 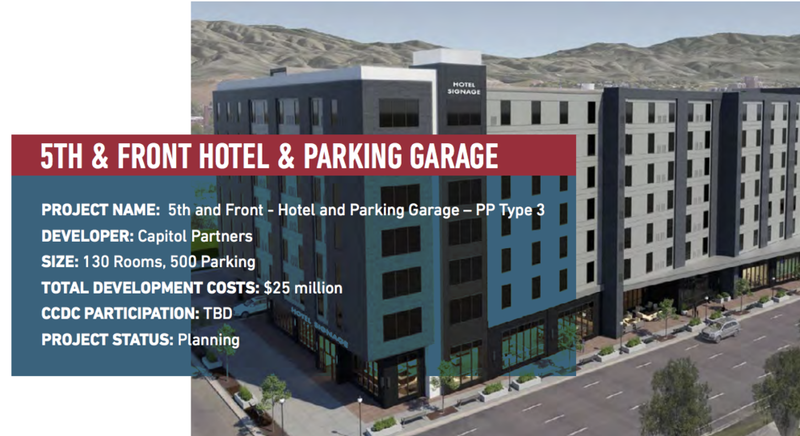 Several other miscellaneous parking types would also increase - including hotel valet, which currently costs $2.85 per use -- and would would more than triple in price to $10. Folks who self park for a hotel would see the daily rate rise from $5.70 to $10 - an increase of 75%. The monthly "night plan" - which allows workers who work the late shift downtown - would increase slightly from $43 per month to $50. A public hearing is slated for noon on November 13th at the CCDC board room - 121 N. 9th St., Suite 501.